You know that thing we do when we’re afraid of what might happen if we take ALL the risk? When the fear rises in our throat at even the thought of going all in? You might know it as hedging your bets, or spreading the risk. It’s what we do to keep ourselves safe. It’s a natural thing to do really. 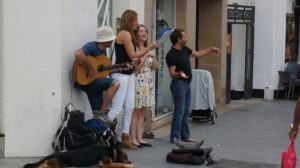 Especially in a world of reality TV where ritual humiliation has become entertainment – you’ve got to be courageous on a whole new level to sing in front of Simon Cowell right? 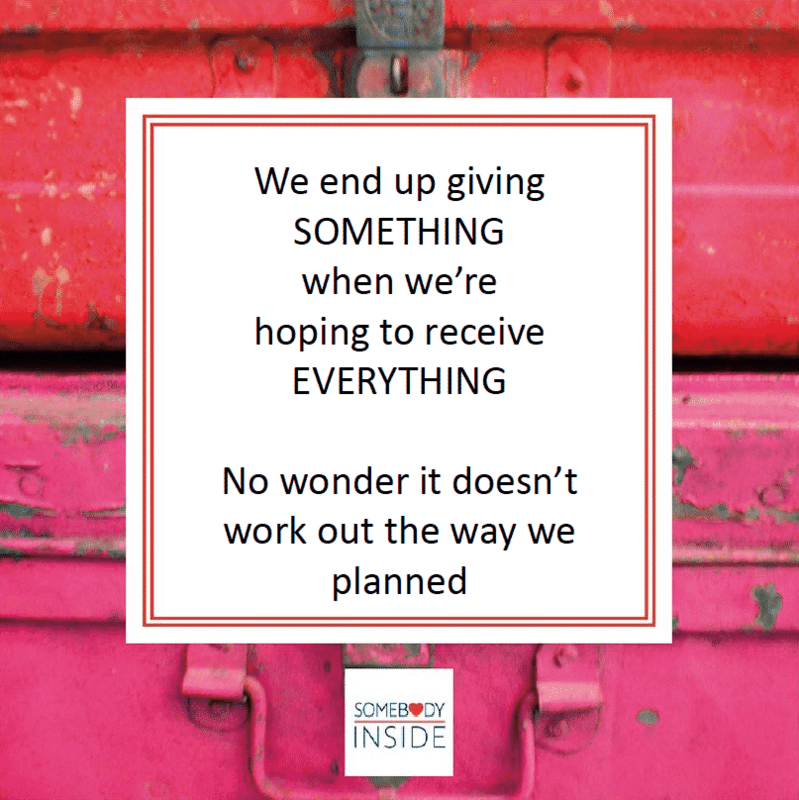 Except we end up giving SOMETHING in the hope of getting EVERYTHING. Now I’m no mathematician (truly, many people in the world will vouch for this) and even I can see that this equation doesn’t work. (Or at least not that I’m aware of). Ladies, we are particularly good at holding back. It’s one of our specialities. The research is clear. We don’t go for jobs, because we don’t think we have all of the qualifications. Every time I ask a woman, ‘What is it you’re brilliant at?’, she looks at me like I have grown two heads. Sometimes she shakes her head sadly and says, ‘I don’t know’ or, ‘nothing really’ and other times she fluffs her way through a few things, completely unable to own that she might be brilliant at anything at all. Just think for a minute. Would you do that too? Look away awkwardly? Hope I’d move onto another question? It’s OK if you would. We’ve been brought up to be humble, to play things down, to avoid humiliation, or worse, heart break. To keep it all inside and to never give everything away, JUST IN CASE. I want to tell you a story that made me realise that there are times when ALL IN is the only option. About five years ago, I was in Spain with a bunch of special people. We were away discovering ourselves. You know the kind of thing even if you haven’t experienced it. Conversations, tears, challenges, growth. At times painful, and yet the breakthroughs always made it worth it. When we held back what we were really thinking, what we were really wanting to explore, we missed out. When we hid our challenges in fear of the hurt we might create inside ourselves, well, the lingering, long term hurt, it just stayed there. Festering away, limiting our life for the future. In the same way it always had. WE KNEW THAT’S WHAT WE WERE DOING. AND YET SOMEHOW, IT STILL SEEMED LIKE THE EASIER CHOICE. One day we were given a challenge. To get out on the streets of a local town and make a difference for someone in return for a thank you note. So here we were, in a foreign country, with only one native language speaker in the group, asked to help strangers. Which is SO MUCH HARDER THAN IT SEEMS. No kidding. People didn’t want our help. Not really. They looked at us with suspicious eyes when we offered to wash their dishes or carry their boxes. The only people who really wanted our help were leaflet distributors. Of course they did. Because there’s a thankless task. And whilst an hour of leaflet distribution got us our thank you note, we were despondent and sad. We knew we hadn’t really met the challenge. We hadn’t made a difference in someone’s life. Leaning up against the wall with his battered guitar and his speaker all strapped up with masking tape. A dog resting at his feet. ‘There he is!’, I pointed excitedly to my friends. ‘We need to make him some money’. There was a bit of shuffling. A bit of ‘how on earth can we do that?’. A bit of ‘What if he doesn’t know any songs we know?’. A whole load of discomfort, unease, stepping away. Until one of us stepped forward. Stroked his dog and smiled at him. Somehow the conversation started. We asked if we could sing with him. Hey, he clearly thought we were mad and I guess he had nothing to lose. And as he started to set up again and share with us his tiny book of songs, we were all filled with fear again. There was still time to stop this nonsense. To get away before anyone really noticed. Our tiny group dispersed, till there were two of us standing next to him, while others found important jobs to do. He was in. We were not. With a sick feeling in my stomach, I realised this was the moment. ALL IN was the ONLY option. If we sang half heartedly it was going to be the most humiliating experience ever and worse, we would have brought this poor guy into it. Even though we had nothing but our voices, which were at best average, we were going to need to give it everything. Actually scrap that. Because we were going to all start singing together, I WAS GOING TO HAVE TO GIVE IT EVERYTHING. I had no idea how loud or passionately everyone else was going to sing, I could only do MY best. It was ‘Yesterday’ by The Beatles. I guess it helps I grew up in Liverpool. This song has home in it for me. I sang as loud as I could. Brilliantly? No. With heart and passion and nerves and hope? Oh yes, my very best at that time. You know what happened friends? People gave us money. Kids danced. We danced. The Police came and decided not to shoo us away. There was smiling. There was love. It didn’t come from talent. It came from love. We only sang four songs. And one of them was Yesterday again. That was all we knew. It didn’t matter. We had done what we set out to do. We had our thank you note. 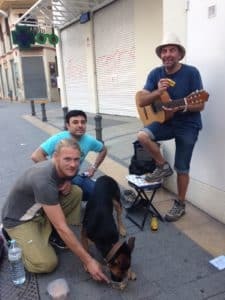 And our friend, Georgi, he had over 50 Euros in his pocket and a smile on his face. He asked if we would come again. We smiled. We’re leaving tomorrow. We hugged him tight in his grubby clothes and fed his dog. With our first real experience of just what can happen when you decide to go all in. Does it work every time? I shouldn’t think so. Nothing does. In that moment though, I KNEW. I knew we had a choice. I knew that stepping away would have resulted in great disappointment, so the ONLY chance we had was moving forward and going ALL IN. It was all we had. You have those moments in your life too. I know you do. I know because we all do. How about going all in with that one that’s calling you? I’ll hold your hand if you like. P.S. Living in Scotland and need to come meet some like minded women? Then we have TWO great events for you to come along to! On 25 November, we’ll be hosting an intimate screening of the acclaimed Body Image Documentary, Embrace in Edinburgh. This comes with a fabulous Q&A session with our very own, Body Image Movement Global Ambassador, Danielle Macleod and the incredible Karen Finlayson from Colour Elements. Film suitable for 12 and up. Get your tickets here. We’ve also released tickets to our January 11 2018 Women’s Thing. Now THERE’s a great way to start the New Year! Get tickets for The Women’s Thing here.